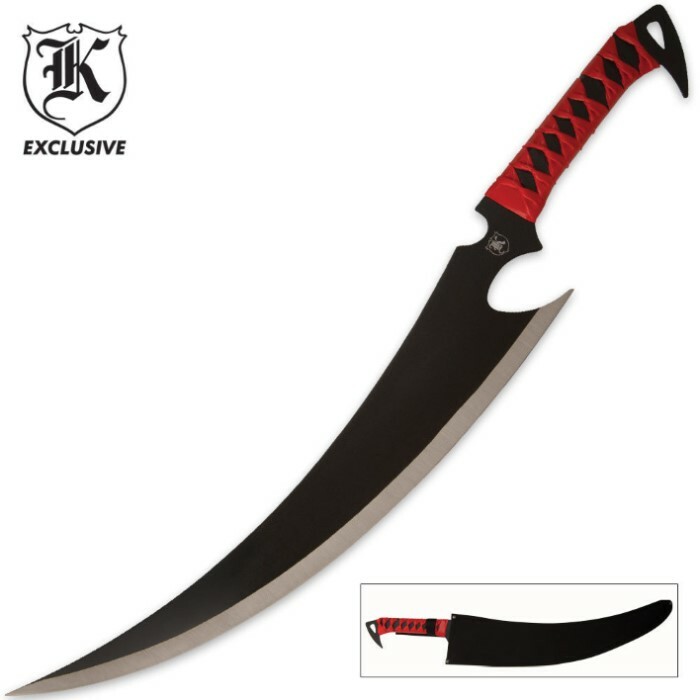 Red Fortress Fantasy Short Sword & Sheath | BUDK.com - Knives & Swords At The Lowest Prices! This Red Fortress Fantasy swords measures 28” overall and is constructed of stainless steel with a heat-treated black baked finish. The 20” blade features a piercing point and slides smoothly into the included nylon blade sheath. This was my first purchase from Budk. Overall I was impressed with the quality, and the sword looks absolutely beautiful hanging on my wall. The only drawback was that it wasn't sharp at all. For less than $15 this is a very good sword. It came to me very sharp as well. A pretty cool looking fantasy sword that is barely average in reality. Sheath seemed like ballistic nylon stuff, but was stiff enough to sheath alright. The blade itself was a little thin through the spine so expect vibration upon use. "Use" test upon compressed cardboard revealed a pretty good slash ability, but was surprisingly weak upon thrust with heavy flexion of the blade. The wrapped handle will definitely come unwrapped so be prepared for this. Some thickening of the spine and a better done handle and this blade could actually be used. The better blade of this sort for the money so it is not all bad. A perfect sword. I see lots of complaints about grips and wrappings, but mine was excellent. In any case, you are not William Wallace for crying out loud - it's a $15 sword, I repeat, a $15 sword. I had problems with the last $15 fishing reel I bought too - get over it, make whatever modifications you feel are necessary, and go enjoy your new toy! Is the late-nite intruder you confront and scare the heck out of with this going to care that the wrapping was a little loose? I don't think so. I have three BudK swords, and each one was exactly as advertised - perfect in every way. Keep up the good work, fellas! Good long sharp blade but when I got it the grip started to come undone and when you took the blade out it would be sticky. Make sure you have WD-40, but besides that its worth the price. This sword is good. The red wrapped handle is not tightly wrapped, its a little loose. The blade is a little sharp but not razor sharp. The good things about it is that it looks amazing. Every time I show someone new this piece in my collection the first word out of their mouth is WOW. Its a really cheap sword, great for the price. I would buy again. Great wall hanger, I would not go chopping trees or tall grass with it. Its a very good conversation starter. Get it for the good price.